Japanese film maestro Akiro Kurosawa’s movie Rashomon is a wonderful meditation on truth and bias; four people witness the same event but describe “what happened” and “why it happened” very differently. Unlike physical scientists who can claim objective measurement, social scientists need to be more tentative about evidence, narratives, and conclusions. Over the last 18 months a false narrative about mob violence being driven by political blessings – the opposition recently claimed that the central government and BJP overtly support a lynching movement – is being amplified by some parts of the press. I’d like to make the case that the notion that anybody or any political party supports mob violence based on religion, caste, or eating habits is at best, prejudice and at worst, dishonesty. I hang this case on some widely reported incidents in my state to make the argument specific but my three broad themes – allegation vs conviction, story vs data, and individual motivation vs group bias – are important considerations in all incidents of mob violence. First, allegation vs conviction. Two important principles of justice are ‘innocent until proven guilty’ and habeas corpus (protection from unlawful detention). Like Rashomon, any violence usually involves different versions from eye-witnesses, perpetrators and victims. Good police work involves taking allegations made by all sides, investigating and presenting the case to a court for justice. Allegations are not convictions. In the Pratapgarh incident that involved the regrettable death of Zafar Khan after an argument about open defecation, there are various versions of where, at what time, and how the death took place. His death was a tragedy, investigations are on, and anybody found guilty will be charged, convicted and jailed. Similarly in the incident involving Pehlu Khan seven suspects have been arrested, cases registered, and court challans filed. When proven guilty, they will face punishment. Second, stories are more powerful than data. This human instinct is amplified in India because of the scale of our grinding poverty, painful history and deep injustices. While every unnatural death is a tragedy that should be prevented, it is a painful reality that violence and human nature sometimes go together. Over the last three years there has been no change to the number of deaths in Rajasthan (though both murders and mob violence incidents are lower in 2017 than in 2012) or communal mob violence deaths in India. Unfortunately, roughly 22,500 people die of natural and unnatural deaths in India every day; every politician I know dreams everyday of reducing natural deaths through better healthcare and unnatural deaths through police reforms and social change. Third, individual motivation vs group bias. Human beings are cracked vessels; we aren’t perfect, don’t always handle disagreements with dialogue, and as individuals often suffer from racial, religious or gender prejudices. 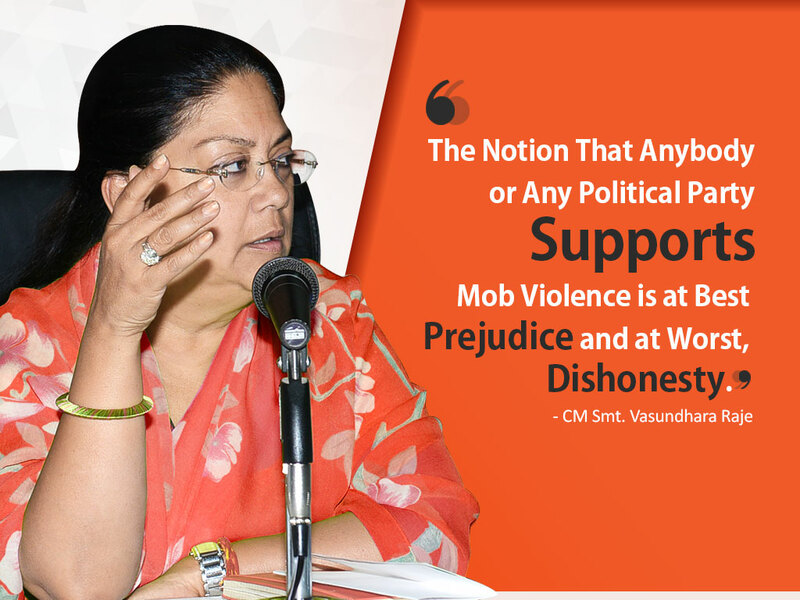 But extrapolating individual acts to entire groups – all Rajasthani men are chauvinists, all members of BJP are intolerant, etc – is unsound, unfair and unscientific. Leo Tolstoy wrote that happy families are all alike but every unhappy family is unhappy in its own way; most incidents of mob violence involve a curious confluence of individual motivation, circumstances, and delayed police action. It is shameful to debate whether the extreme right or extreme left is more violent and it is malicious to suggest some state administrations are “blind in the right eye”. Individuals must bear the full consequence of their actions and generalisations about groups are unhelpful. Prime Minister Narendra Modi has emphatically and repeatedly described all mob violence as illegal acts whose perpetrators should suffer the full consequences of their actions under law. As a chief minister, I often compare notes with my colleagues in other states and all of us are clear that we never condone violence, the Constitution is supreme, and all citizens irrespective of race, religion, and gender are equal under law. I submit that anybody who suggests that any political leader or political party supports mob violence is either prejudiced (BJP’s nationalism and patriotism is inconsistent with tolerance) or dishonest (data doesn’t matter when narratives and stereotypes can be crafted). Of course the only consolation for a victim’s family is justice and I acknowledge we need to work harder to make our criminal justice system more inclusive, speedy and fair. Many Indian metrics have gotten better since 2014: life expectancy, literacy, childbirth deaths, inflation, cleanliness, economy formalisation, currency strength and violent deaths. Lower violence is a global phenomenon. An interesting book by Steven Pinker called The Better Angels of our Nature: Why Violence has Declined suggests that five forces – modern nation states, commerce, feminisation, cosmopolitanism, and education – have reframed violence as a problem to be solved rather than a contest to be won. It is not my case that mob violence deaths in Rajasthan and India are zero, but I recognise that zero is a goal that Rajasthan and India should aspire to. The current gap between our aspiration and our reality is not a lie but a disappointment. This is a gap that politicians may not close in our lifetimes but we will die trying.